Once In A Lifetime – The Final Tour offers the last chance to see your favourite acts together all on one stage at arenas across the country next June. 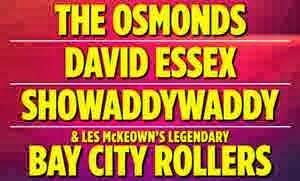 It features The Osmonds, David Essex, Showaddywaddy and Les McKeown’s Bay City Rollers taking in 8 dates and starting at Manchester’s Phones4U Arena on 20th June and then touring to Leeds, Cardiff, Newcastle, Liverpool, London O2 and Birmingham ending at the Brighton Centre on 28th June. Booking opens on 18th October.